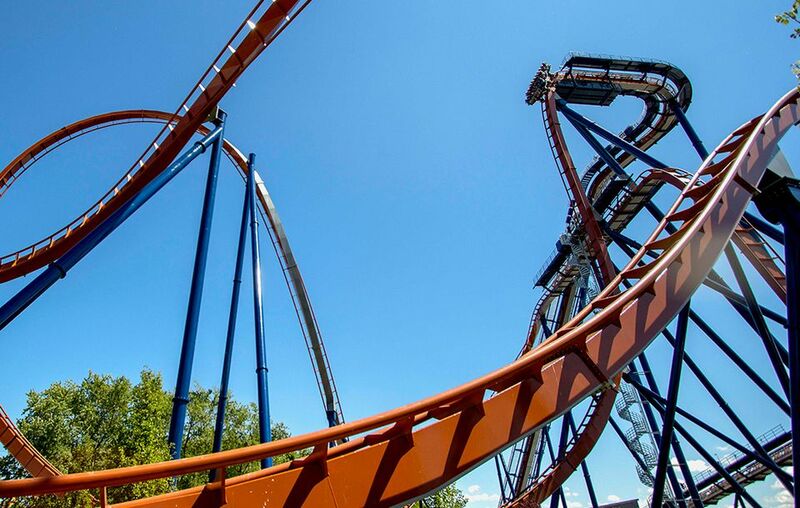 Dive coasters such as Griffon at Busch Gardens Williamsburg and SheiKra at Busch Gardens Tampa have sometimes been derided as “one-trick ponies.” The first drop, critics contend, is the sole highlight of the entire ride. Cedar Point defies the stereotype with Valravn, the world's longest dive coaster. It may not include special features like a tunnel or splashdown, but with two 90-degree drops and three inversions, Valravn keeps riders engaged and screaming from start to finish. At the station platform, riders load into one of three trains, each with three rows of eight seats. The ride experience is slightly different depending on if you are sitting in the front, middle, or last rows. For the full effect of a dive coaster's first drop, however, you really should sit in the front row. If you don’t want to wait for the front, grab one of the outside seats of the other rows. Even though Valravn is a floorless coaster, the middle two seats in the second and third rows have a platform that connects the cars. It obstructs the view below the train. Valravn implements the latest vest-style, over-the-shoulder restraints from B&M that it has used on recent models like GateKeeper, Banshee, and Thunderbird. They offer a great deal of comfort but still allow plenty of movement, so riders can fly out of their seats (safely, of course) during the drops and zero-G elements. As the train dispatches from the station, it makes a quick 180-degree turn toward the lift hill. When riders crest the top of the first hill, they get a great a view of the north side of the park with glimpses of Millennium Force, Top Thrill Dragster, and Rougarou. A slow 90-degree carousel turn 223 feet in the air provides a fantastic panoramic view of the rest of the park and Lake Erie beyond. Just as riders begin to get comfortable soaking in the gorgeous views, the train tips over the edge at a frightening 45-degree angle and leaves them dangling helplessly and staring straight down at the ground for a precarious few seconds (that feels like forever). This is the prelude to the coaster's signature dive. After a satisfying 214-foot, 90-degree freefall, the coaster races through three inversions, a second 90-degree drop (with no hesitation the second time around), and additional maneuvers that deliver great airtime. As Cedar Point’s 17th roller coaster, Valravn is a solid addition that should appeal to a large audience. Everything about the ride is impressive, from the massive size of the track and supports to the ultra-wide trains. Not only is Valravn thrilling to ride, it’s also fun to be a spectator and watch the trains move smoothly around the track. Recent B&M coasters like GateKeeper, Banshee, and now Valravn have focused on big, wide elements that tone down the intensity. They help make the coaster more comfortable to experience and easier to re-ride. Guests that might be intimidated by extreme rides like Millennium Force or Top Thrill Dragster might be willing to tackle Valravn. It’s truly thrilling but more accessible. Cedar Point has been focusing on placemaking and landscaping with its recent additions. GateKeeper and the front-gate renovation of the park in 2013 as well as the Gemini Midway enhancements in 2014 are great examples. For Valravn, the park has added a new plaza with beautiful flowerbeds, paver walkways, and plenty of benches for non-riders to take in the sights (or for riders to catch their breath after conquering the coaster). The park has also opened up the Blue Streak midway into the Valravn area, thereby creating a new pathway with views of Raptor. The lighting package on Valravn features bright, multi-colored LEDs that line the lift hill. White spotlights illuminate the entire track layout at night. It's quite a sight and allows guests to enjoy watching Valravn after sunset as well as during the day. One disappointing feature is the duration of the ride. When riders hit the final brake run, they are likely to be wanting more. However, at 2 minutes and 23 seconds, it is longer compared to other dive coasters. Valravn offers wild height, tremendous speed, and a unique dive coaster adventure that is currently offered in only two other U.S. parks.